A few days back I was sent a big fat box by Olive Tree Trading and FBAI and I was quite surprised upon opening the box. I received 2 liters of double toned milk. 2 liters of Olive oil and 1 kg Quinoa. It is not that I didn’t like the products but I was confused with the type of combination! I mean Quinoa, Olive Oil and Milk indeed are interesting as a combination. Now that the milk was there I had a bit little time to come up with an all-inclusive recipe but I decided to use all the ingredients while making a dish and after hell lot of permutation and combination, I decided to make veggie loaded Quinoa Pulao with spice-infused Paneer. This Spice infused paneer is something Pasta loves a lot where I add some flavoring while making the paneer to give it a savory taste. 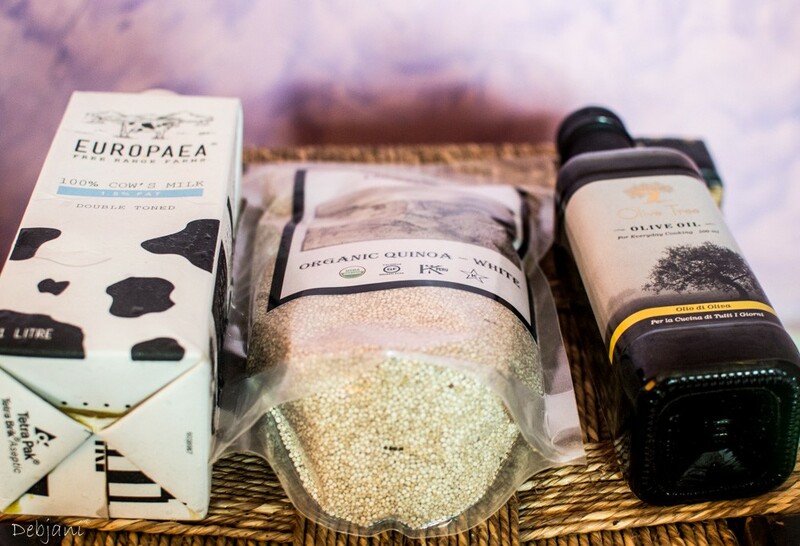 Coming to the products I received from Olive Tree Trading and Food Blogger Association India, I found the Quinoa really good and especially happy with the after-taste. The Olive oil is of good quality and I have used that in other dishes as well. I am completely satisfied with the paneer I made from the milk. I have used 1-liter milk for making Sevian as well. 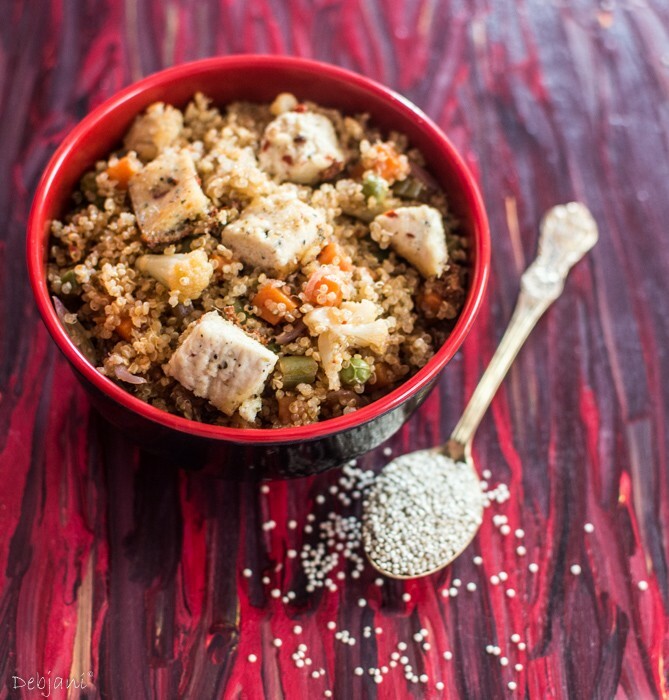 Quinoa Pulao with spice-infused Paneer is as I already mentioned an all-inclusive meal with the goodness of quinoa, veggies, and paneer and I have used olive oil for stir-frying everything. It is a good source of Nutrients and is also gluten-free. Quinoa is basically a pseudocereal and is not typically look alike rice or wheat but has a grass type texture. This particular crop got populated immensely between 2006 and now and the price increased almost triple because of the acceptance in United States, Canada, Europe, Australia, China and Japan etc. now it is getting popular here in India as well. 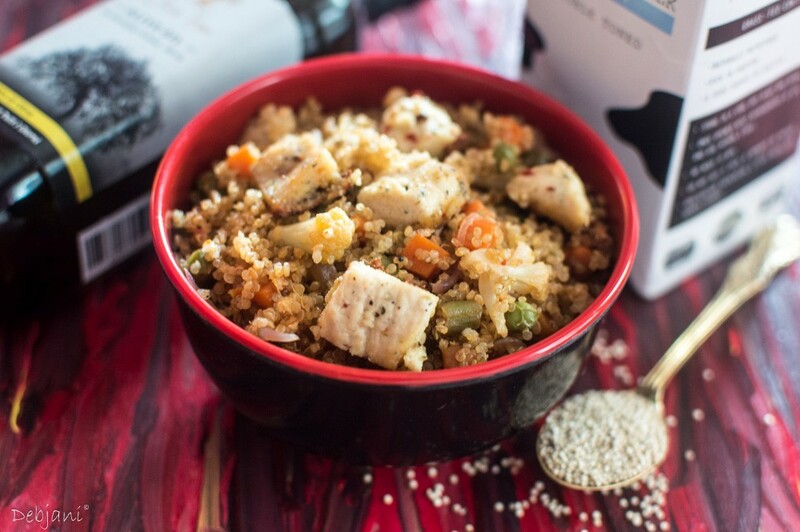 Now let me get straight to the recipe of Quinoa Pulao with spice infused Paneer where I make the Paneer at home by adding some spices and salt and the pulao was loaded with veggies and little flavorings. 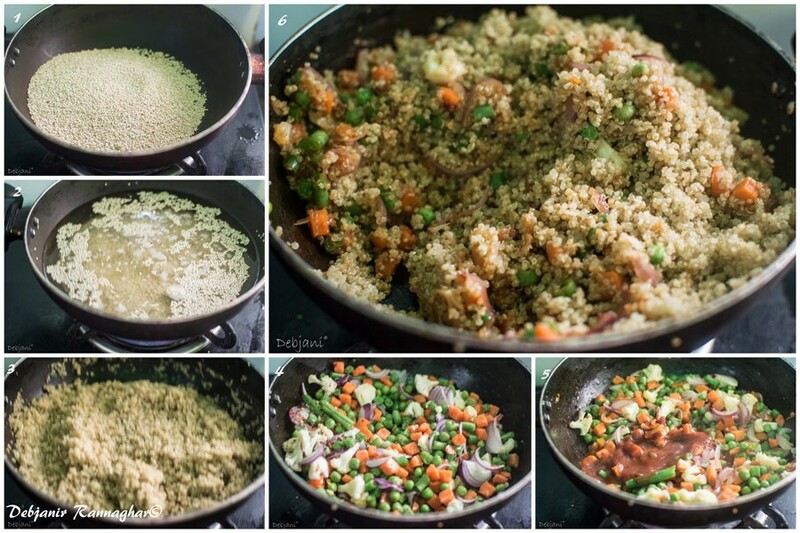 Cooking of Quinoa is almost similar to the cooking of rice. You need 2 cups of water to boil 1 cup of Quinoa and the properly boiled quinoa should have little crunch alike the al-dante state of pasta. Boil the milk for 5 minutes in low flame and add salt, Chili flakes, and mixed herbs and mix properly using a ladle. Now lower the flame and add lemon juice to curdle the milk and switch the flame off after curdling started. Wait till the temperature drops and discard the water from the curdled milk. Take the curdled milk over a piece of cheesecloth and tie all the ends and put a piece of weight over the same for 10 minutes. 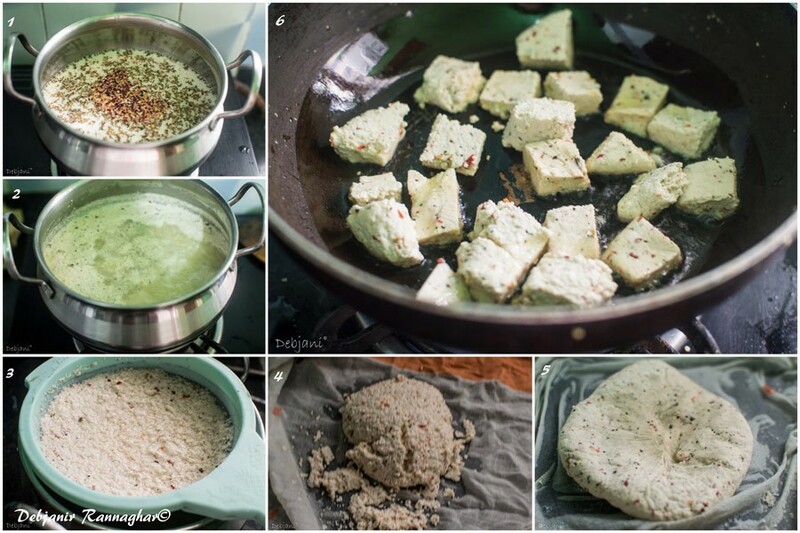 After 10 minutes remove the weight and after opening the cloth cut the paneer into pieces for further use. Wash Quinoa and start boiling the same in medium flame with 2 cups of water after covering the pan with a lid till the entire water absorbed and the quinoa cooked properly. In a pan heat Olive oil and sauté the Paneer lightly. Start frying the veggies in remaining oil for 5-6 minutes or till the veggies soften. Add salt, chili flakes and mix properly. Add boiled quinoa and mix thoroughly and cover the pan with a lid and cook on low flame for 5 minutes. 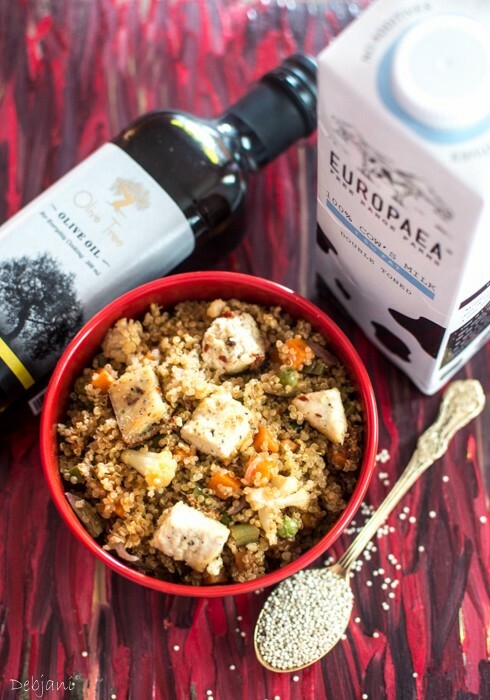 Open the lid and mix the Spice infused Paneer chunks and serve Quinoa Pulao with spice infused Paneer hot. Disclaimer: Debjani was sent the products for review and Quinoa Pulao with Spice infused Paneer can be prepared using ingredients from other brands as well. « My Big Fat Belly : Juicy Lusy and beyond!